Timing is everything, if you decide to bug out and leave! I receive no less than 150 e-mails per day. Many of these are from our readers, even though my e-mail address is no longer listed on SurvivalBlog.com. Readers kept it, even after it was removed. I honestly don’t have time to respond to every e-mail I receive each day. However, one question I get the most often is about bugging out before, during, or after a SHTF scenario, and there is no one answer to this dilemma. I’m getting on in years. Very shortly, I’ll be 67 years old, and I realize that I’m no spring chicken any longer. I can’t do the things I used to do not too many years ago. Bugging out from where I live isn’t something I anticipate doing. However, I always like to plan ahead, or prepare, for as many situations that may come into my life as possible. To be sure, no matter how well prepared you think you are, even if you’re a millionaire, something will come up that you didn’t expect or plan for. That’s just life. Now, with the above said, I do have plans for myself and my family in the event we might have to leave our rural and fairly secure location on short notice. We have several plans. Plan A, if an hour is available, is to load up all our survival foods into our 22-ft travel trailer and hook it up to either my Dodge Ram pickup or the wife’s Dodge Durango. If need be, I’d even hook it up to the oldest daughter’s Nissan Armada. (She lives next door to us, in our small guest house.) Then, we’d bug out. We have several destinations we can bug out to, if it comes to that. 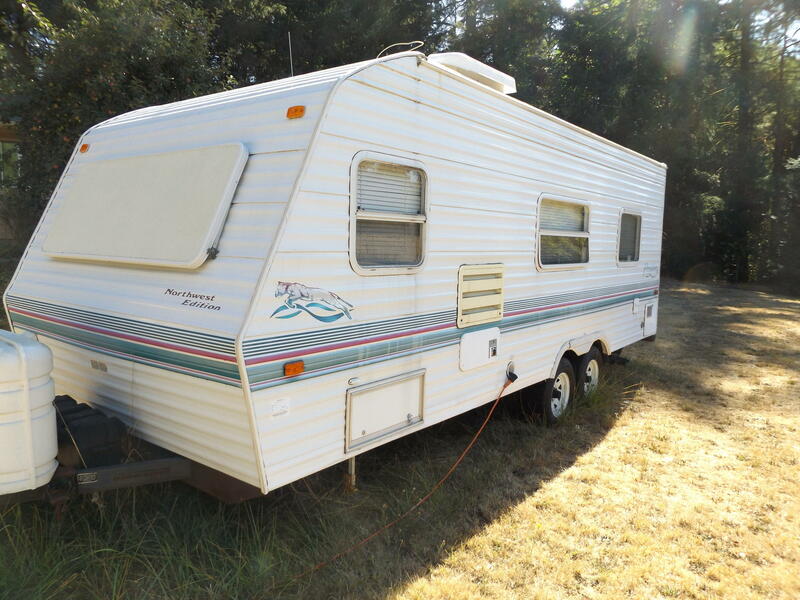 If we are only given 15 minutes time to bug out, we will simply hook up to the travel trailer and leave. We keep a good supply of emergency foods throughout the travel trailer, so we’d be good to go for at least three months. Failing Plan A, we have a Plan B in place, and that is to load up our vehicles with as much food and other supplies as possible and bug out. All of our vehicles have 4-wheel drive, so we are pretty confident about arriving where we plan on going. Between three vehicles, we can take all the supplies we believe we’ll need in order to survive a good long time. Plus, we all keep an emergency box in our vehicles, with all manner of supplies, food, and water. Lastly, if Plan A and Plan B are not workable, we all have bug out bags, and we can evacuate on foot if need be. We aren’t kidding ourselves, especially myself and my wife; we are not going to be able to cover 25 miles per day on foot. That just isn’t going to happen. However, where we live, in the foothills of the western side of the Cascade Mountains, if you give us five minutes, we can literally disappear from sight to where it would be difficult to find us. Once again, we feel pretty confident where we live that we can wait out most emergencies or scenarios that might force others from their homes. We’ve had a bone-dry summer in Western Oregon, as a matter of fact, most of Oregon, and we keep a very watchful eye for any forest fires in our area. Luckily, we had no fires in our area this year. Thank God! 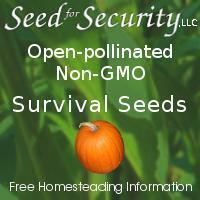 We have everything we need to survive most situations that may present themselves right here in our home and on our small homestead. I don’t plan on engaging in any war-like military actions, if I can avoid them. I’m not kidding myself, even though I’m a military vet who was trained as a combat infantryman, as well as in other areas. I can’t possibly take on a lone platoon of trained military personnel and expect to win. It just isn’t going to happen. I’ve attached some pics of our travel trailer. It is a light-weight model, but it can still carry everything we would need. We have survival foods in every nook and cranny. Much of it isn’t shown in the pics. 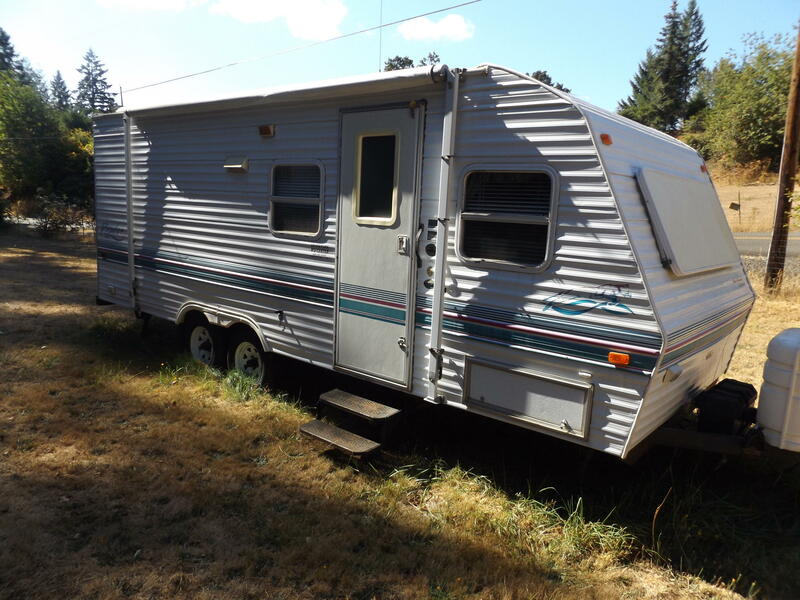 We can live in this trailer, if we had to; there’s not a doubt in my mind. We have several portable generators, so we can keep the batteries charged up, too. Our smaller generator has a peak 1,000 watts but a steady 900 watts. Using it as needed, we can keep the batteries charged up for a long, long time on the fuel we have stored. We also have a larger generator that can be used as well. However, the smaller generator will suffice for most of our needs and uses very little fuel at all. Of course, we have a propane stove for cooking in the travel trailer. We also have several rocket stoves as well as a solar oven. So, we have several ways to do much of our cooking. 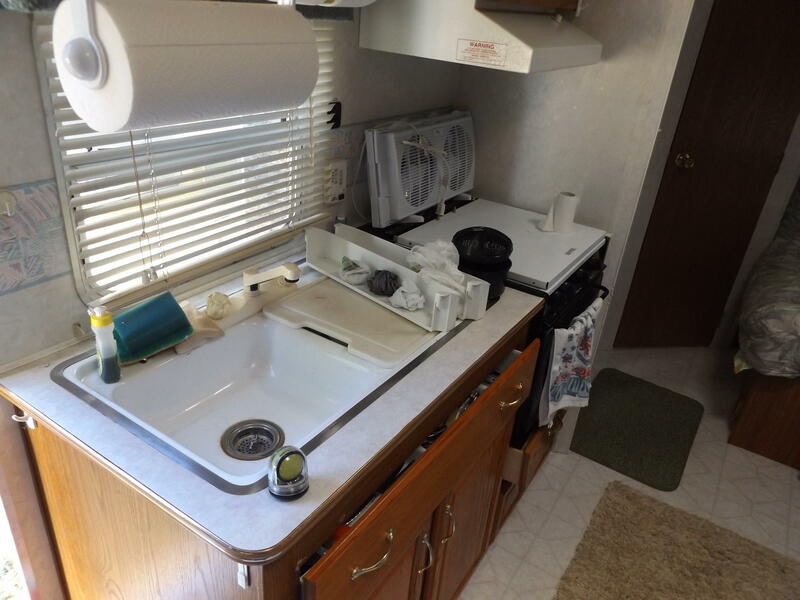 The smallish ‘frig that is found in most travel trailers wouldn’t be used much. If the ‘frig is used, it uses very little propane. We wouldn’t run it off the generator. There’s no need for that. We have a full bathroom, all things considered. 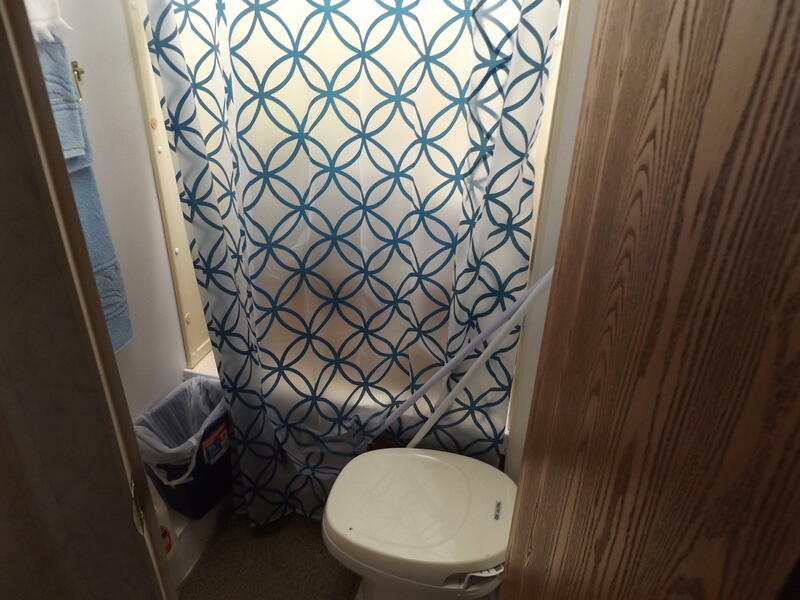 It has a small stand-up shower, a sink, a toilet, and a 5-gallon hot water heater. We’ve learned how to take a very fast shower with the limited amount of hot water on hand. Heating hot water uses propane. Though we have spare propane tanks, we sure wouldn’t be showering daily in a bug out situation. So, our first plan, if it comes down to bugging out, is to finish loading up the travel trailer with everything else we believe we’ll need as well as our vehicles and leaving the area. It’s a fairly solid plan, for the most part, and it would make life more comfortable than living in a tent. BTW, we keep a large camp tent in the trailer as well. We keep extra sleeping bags and blankets in our trailer as well. It’s amazing, with some planning and time, how much stuff you can load into a small trailer. We all keep extra clothing in the trailer as well as foot wear, too. Plan B, if there isn’t a lot of time, is to grab whatever extra food and supplies we’d need and load it into our vehicles. We can carry a lot in those rigs and bug out that way. It’s not a perfect situation, but it is workable. We have two big German Shepherds, and our oldest daughter has one German Shepherd, so we keep plenty of dry dog food on hand for our critters. We also never let our gas tanks drop below ¾ of a tank of fuel. This is just a good practice for everyone. We have several destinations we can head to, and with just ¾ of a tank of fuel we can easily reach them. The last plan, plan C, we wouldn’t relish, as we’d have to bug out on food. There is only so much you can carry on your back in a backpack. It took us all several years to find just the perfect packs for each of us, and we all have different packs. Food and water is the main concern when bugging out on foot. You can’t carry all you’ll need. Of course, our final destinations that we plan on aren’t very far. Still, they’re a good distance to walk to. I always get this question about weapons for self defense and hunting. I’ll try addressing it first and as best I can. I know many preppers use prepping as an excuse to buy more guns and ammo. They really need to admit to themselves that it is just that, an excuse to buy more toys. It’s just that simple; there is no “right” or “wrong” when it comes to firearms. They all serve different purposes. I’m only going to address a few firearms in this article, even though I have firearms enough to cover just about any situation that may come along. As you will see if several of the pics, I have two slightly different arrangements. In one, you will see a Blackhawk Products www.blackhawk.com tactical 9mm mag pouch that carries three 33-rd 9mm GLOCK mags. I also have a Blackhawk tactical thigh holster, and it has a GLOCK 19 along with two mag pouches with two loaded mags. 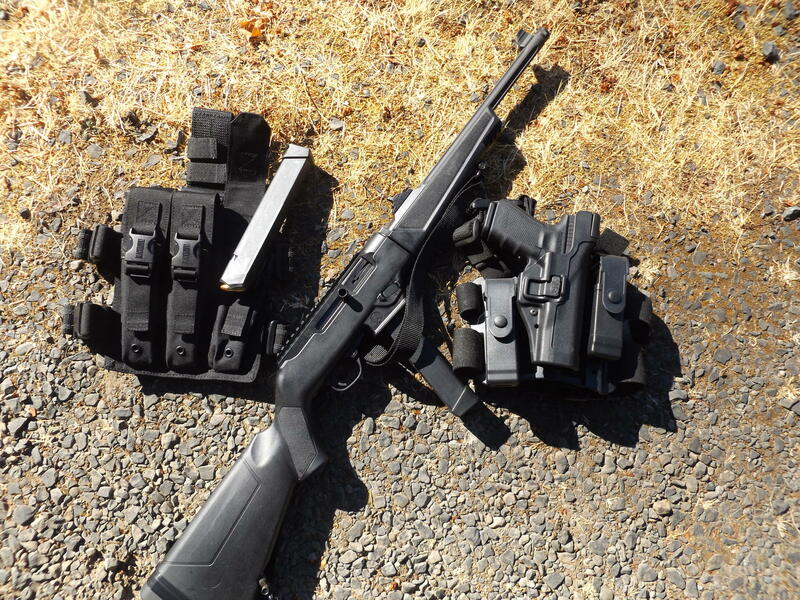 In this setup, I have a Ruger PC9, 9mm carbine. This is a great setup. The GLOCK 19 takes the same magazines as the PC9. As I stated at the onset, I don’t plan on getting into a fire fight with anyone, if I can avoid it, but should it happen, that Ruger PC9 and GLOCK with all the spare ammo will surely prove their worth. 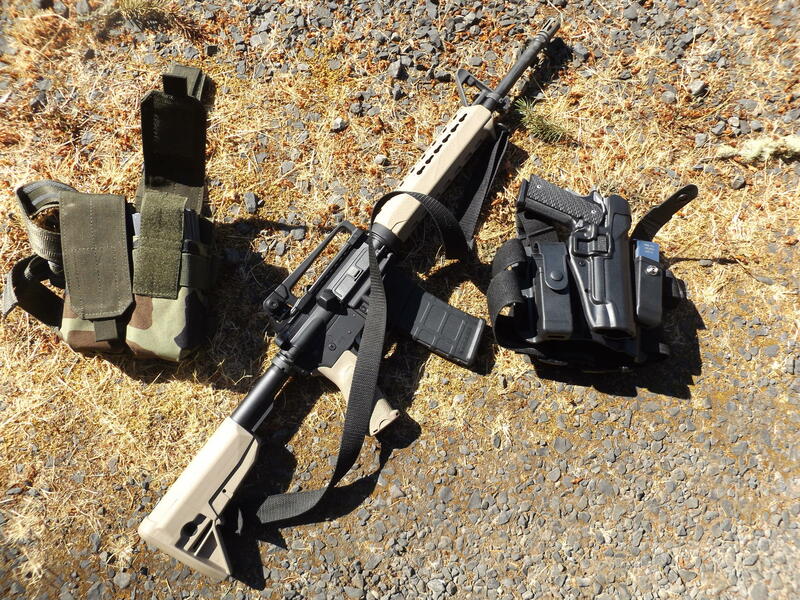 In another pic, you will note that I have a Springfield Armory SAINT AR rifle, which is one of my favorite ARs. I also have a Blackhawk tactical thigh holster, except this one is setup with a Kimber 1911 CDP .45 ACP handgun with spare mags. There is a thigh mag carrier with four 30-rd mags in it. So, with this setup, I can sure give a good accounting of myself if need be. If bugging out on foot, I would select one of these setups and my bug out bag, and I’d feel well-armed. Tomorrow, I will tell you about my choices here and discuss other preps for bugging out. What I just don’t understand, is that if you live in such a remote, country location, why would you see the need to ‘Bug Out’ in the first place ? Could you please elaborate on that for me ? While I wouldn’t attempt to speak for Pat, in my opinion, there should be a bug out plan regardless of where you live. There’s always a risk of someone finding your location. History has shown that there is no such thing as a completely defendable fixed location. Plus, as he mentioned, there are natural threats such as fire that would require bugging out. One example, mine not Pats; would be wildfire. Knowing where Pat C lives ( I am within 75 miles) I can tell you we experienced some ridiculous wildfires a hundred miles south of us and many folks were forced to evacuate their homesteads. Try as we might to prepare for everything, when the Sheriff says leave or we will drag you out, well, you act like a responsible citizen and bug-out. Having a BO plan enables folks to leave on their terms and with the right equipment- if one waits until the Sheriff pounds on the door (forget about any sovereign citizen claims and other nonsense), there may be a limitation of taking trailers or other items factored into the plan. In Colorado a few years ago there was literally a knock on the door and the deputy waited in the driveway for fifteen minutes. Move it or lose it was the active and lawful order. Once you have plans in place it would be helpful to ask yourselves, ‘What events would trigger an immediate bug-out to your retreat?’ Then WRITE THEM DOWN. Any threat of nuclear attack anywhere. Any actual EMP attack anywhere. Sudden social unrest and/or panic similar to the EBT card glitch but more widespread. Sudden widespread panic buying of food, fuel, guns and ammo. Seeing bank lines or hearing threats of limiting cash withdrawals or freezing of assets. Any high level US assassinations or arrests of anti-government groups. Any gut feeling that martial law may be imminent. Any gut feeling that door-to-door gun confiscation may be imminent. If you’re told to “remain calm and carry on, order is being restored”. People want to believe it so they will believe it, and there’s your opportunity. First out is best out. I, too, would like to know. I question that bugging out is useful for urban/suburban areas, but if you already live at your retreat and have roots in the area, I wonder if bugging out is the most vulnerable thing a person could do. Of course, this thought depends on the scenario. Survival means, “To survive”. As long as you can breathe, you should be prepared to do whatever is necessary to remain alive. I do not speak for Pat, but from my research and in this day and age, a remote location is absolutely no guarantee of survival. I won’t argue that such locations are certainly safer than the “city”, but it only provides a delay in the inevitable if you choose to stay to the death. With the obvious reasons being fire and fallout, there are a couple of other reasons I have found. 1. The Government– Forget the fantasy of fighting of the “Golden Horde”. The most likely enemy will be some form of a rogue authority. These organizations have spent trillions to survive almost every disaster imaginable. They will survive in some form and all sorts of records exist that will clue them to your location (property tax records, deeds, etc.). 2. The “Earl and Cletus” Factor – I have visited some of the most remote locations you can imagine South of the Mason-Dixon Line and East of the Mississippi. Without exception, there has been at least one family that has lived there for generations. They know every back road and hollow. They know you are there and you will always be the stranger. As I was once told, “Just because you live here, don’t mean you’re FROM here”. For seven years, this man survived by himself, avoiding law enforcement, in the mountains of Utah. Remember, most “experts” will tell you this is impossible. Be ready to do whatever it takes to remain alive. Thanks for you reply. I have a different perspective on what survival means, and both of your points 1 and 2. I will be short. Survival, as we understand it today, started with colonialism and European travel writers who wrote stories about ways of living outside of the European supply line. In older history, survival means “to return to” a specific way of life. So, what is the difference between “survival” and “wilderness living”? I think it is dependency on supply lines and ideology. Your point 1: Since the 1600s, government and military are interested in modes of production and supply lines. The modern military cannot function at optimal level without supply lines. As such, their primary goal is to secure modes of production and supply lines. They care not about a single retreat with some survival food. The military and government has been petitioning and supporting modes of production and the people who produce for 100s of years. They want to develop and maintain supply lines, not steal a very minimal amount of supply from a single person and anger the local populace. Has this happened in history? Sure. But, its an externality and not the goal. Your point 2: Yes, xenophobia is a real issue. The best bet here is to put down roots and build community rather than play the gray man. Know the powerbrokers in your area. Troy Knapp was an interesting story. I am not sure how a single person comes in to play with a retreat being overran, though. You miss the point. Either you plan to not fail or you fail to plan. I do not intend to “bug out” but life and chance can change my future and bugging out may be the only choice. If it comes to that a well planned option will be a good thing. That is quite the utopian vision of government you have there. I was speaking to the governments that in the last century are responsible for the deaths of over 262 million civilians (democide). I was thinking of the ones that produce nothing but graft and corruption and extort taxes and fees through threats of violence and incarceration. In the US, executive orders have already been signed that allow for the confiscation by force of any resources deemed necessary. Self-reliance or non-conformity to the state will not be tolerated . They have already shown that they will confiscate firearms (Katrina), lock down entire cities (Boston), and kill if you fail to comply (Waco, Ruby Ridge). I cannot imagine any circumstance where once empowered with “National Emergency” status they will care about “angering the populace” or give a rat’s behind about what you produce. @ DD. Great points. I question though that what you define as a resource is different from what the government defines as a resource. You do have excellent points, however. I would generally oppose having the government confiscate resources. But suppose there is a genuine national emergency, say a nuclear attack, should the government say “oh well” and give up??? I assume that anyone in charge including YOU would confiscate resources to save lives. I also assume that failing to do so should be sufficient reasons to lose leadership. Don’t we want our leaders to save lives and see us through a national crisis? Imagine a situation where minutes/seconds count, lives are at risk and the leader of the national guard, coast guard or who ever is trying save citizens lives resolves to ONLY do what is constitutionally allowed and hires a lawyer to help him decide what to do. I would imagine that it would take months to years to finally decide what could be done and it would be too late. Is this how you want/expect our leaders to act in an emergency? Good info. We too plan to use an R.V. as our plan A. We would of course rather stay in our little place which is remote, but has some drawbacks that could cause a need to bug out. There could be lots of reasons for bugging out. Natural disaster (wildfire, earthquake, Yellowstone blows its top etc.) man made (chemical spill, natural gas/oil pipeline rupture, etc) or others. I guess anyplace may have cause. Look what happened in Sunspot NM a couple weeks ago. We bugged 8 years ago. This is where I’ll make my last stand. Too old and busted up to start over. Mr Cascio and I have never met, I live rural as well, but north of him just across “the river”. Two things would be likely causes for us to bug out. First likely reason is wildfire, a year ago we were a mile from the fire line after the fire jumped “the river”. Another reason would be Nuclear fallout. The winds are predominantly from the west as Nuke Map shows. Preps should already be on wheels. A few years ago, my preps lined an entire wall – I used to think it was extra winter insulation! Then I considered how long it would take to put on a trailer. A few hours, I thought. After getting a dual axle enclosed trailer, I began transferring the edible “insulation” to the trailer. It took two days to properly pack it in. Obviously not a crisis-friendly loading time. So I firmly believe your preps should already be packed in a trailer or RV, ready to turn the key and go if needed. Especially if you live in the suburbs. A bug-out bag should have only high-value items like guns and important papers – stored within your house to guard against theft. If you haven’t already, you might want to test each of your extended magazines in each handgun you contemplate using with them. In my Department we found during periodic qualifications that officers shooting smaller Glocks (23’s and baby glocks) using G22 mags for reloads experienced a high proportion of stoppages. These were mostly fail to feed issues. This was especially prevalent with the baby glocks. It was attributed to shooters allowing one or more undercurling fingers to apply pressure to the magazine sticking out of the grip. Just a suggestion and you may not have this problem. I too am getting a bit long in the tooth, almost 70. I have similar plans and keep my 5th wheel pretty well stocked and ready to go. I am in the process of adding a solar system to it. I live in rural area, however there is a railroad within spitting distance of the house, which I see as a problem of wandering hords. I have spoken with some like minded old farts who live about 5 miles away on a farm. One of my locations to go to is there. We will see Eh. I do not see bugging out on foot as an option. I have knee and ankle problems so much that walking more than a couple of 100 feet at a time is an issue. I think he is only planning on bugging out if the homestead is discovered and overrun or threatened by a wildfire. Who would the homestead be discovered or overrun by? Our place is just a few miles south of Pat, near the outskirts of goofball central, Eugene Oregon. among a few hundred thousand of our neighbors. Those neighbors include many thousands of attendees / graduates of the two universities. Oops. Worst case, the multiple earthquakes and multiple tsunamis weaken or drop the bridges going north across the Columbia River at Portland, forcing a few million of our neighbors to refugee south into Salem and Eugene. Why south? West is the ocean, east is desert and cowboys and Indians. Casino Indians, not curry Indians. Both are intertwined communities, accustomed to living / working / hunting outside during rough weather. This next part is a hoot! Did you happen to wonder ‘where is the rally point for the Managers and Administrators of Federal Emergencies?’ Get this… over the Cascade mountains range at the airport near Bend. On foot. In a blizzard. Or during a dry spell. Or a forest fire. With a few millions of our neighbors walking alongside us to help us achieve the impossible. When will help arrive from the government agents? The simple answer is ‘never’. We are expendable. I absolutely love this very informative article. Especially written by a gentleman who is 67 years young, as I, too, am getting older as we all are, and his information gives so much wisdom and direction to all who read it. Thank you! Those that fail to plan, plan to fail. The Cascades have quite a few volcanoes. If the wind is from a particular direction, a cloud of poison gas or super-heated air heading in your direction might be good incentive. Hi Pat – good article and glad to see you’ve got your backup plans set; it’s important to have contingencies. My wife and I had to bug out this past year due to a fast-moving fire that eventually destroyed >1,000 structures, and which only gave us ~30 minutes prep-time; also, as in your plans, we loaded our 20′ trailer and took it with us. 1) know how much extra weight your trailer will support & don’t overload it (my trailer will only allow ~1,200 lbs additional cargo, & most of my bug-out “trailer” items are in totes or ammo cans – I’ve already pre-calculated which totes can go in trailer vs. truck-bed vs. truck-cab). 2) keep the extra items on the floor of the trailer & load them so they don’t shift or fall (it was like a game of tetris packing these things to prevent movement). 3) keep the weight of the items centered over the axle(s) – you don’t want too much positive or negative weight on the tongue of the trailer (my trailer has more floor space in the front, so we needed to keep the weight centered to prevent overloading of my trailer hitch). We were very lucky to have a home to return to as the fire threatening our part of the neighborhood was stopped in our backyard, <10 feet from our shed containing (among other things) our extra propane and diesel (yikes). Thanks for sharing Pat. Looking forward to tomorrow’s info. Living in SE Florida,having several acres,and being very well prepped, I realize that ‘bugging out’ of this area by road, on any type of vehicle, would not be feasible. Traffic gridlock would develop very quickly, and then being trapped out on the road would be a very dangerous situation to be in; to be avoided at all cost. Having a boat, and easy access to the ocean, which I do have, would be my court of last resort. Pat, I’m now 70 so bugging out by foot is not an appealing idea for us either. As an alternative we have bought bikes. Bicycles are a bit easier on these old bones. I agree with Brooksy. I’m to old to run. I will have to stay and hold the fort to allow offspring a safe bug out on foot. We bugged out 30 years ago when I bought remote rough access property where we presently live. If you are at a remote location it buys you a very important factor – TIME TO EVALUATE! Our property’s worst nightmare is forest fires but that usually has a good warning time to get away and it’s not like you have to bug out for eternity, only till the short term danger subsides. If it ever gets down to defending the multiple square miles around us then the Schumer has definitely hit the fan. Pat, I have been thinking about this article all day. Perhaps you will address this in later postings, but please allow me to ask. Is it wise to have ammo in cans pre-loaded in the RV? I live in the great white north, where in the summer temps can get to 90+ with 100% humidity and winter temps can reach 35 below. I am concerned about what that spread will have on what is in the cans. Nobody here talked about having enough fuel to go the extra distance. Gas cans, diesel cans. What if you have to go another 500 miles somewhere? One of the FEW scenarios that could make ME bug out would be nuclear war and coming fallout, as I have no fallout shelter. However, I have studied map s of anticipated fallout patterns and depending on prevailing winds and anticipated targets, I might just squeak by where I am. The 24th chapter of Matthew describes the scenario I prep for . With a side dish of the Maccabees and The Samson Option thrown in for humors sake . I may depart this earth at any time but I plan on going with my boots on and taking some with me . For those of you who own a backhoe or trackhoe you may want to consider this. As soon as the poop flies, go down the road a mile or more and cut the road in to so that no vehicle of any type can pass. Pick a spot where going around the cut would be impossible. Then go the other direction a mile or so past your house and cut the road in to again. By doing so you will only have to deal with those on foot and many would be discouraged to leave their vehicle sitting there at the cut road and continuing on foot. Use a two foot bucket and pile the dirt from the excavation on the far side of the cut, in other words make a long berm so that a vehicle’s tires would first fall in the ditch and then still have to encounter going over the berm. By using this method you can stop someone from going “Dukes of Hazard” and jumping the ditch. This would only work if you lived in a very remote location. RE: Cutting the road to make it impassable. Will prevent vehicular intrusion but also traps you and prevents your escape by vehicle. Better choice: now, while it’s easy, is install a square sided open top road-width concrete culvert 4-6 ft across and at least 4 ft deep. Bridge it during “normal times” with a pipe framework suitable to support whatever vehicle weight load the road is expected to handle – see “cattle guards” used out west for construction details (A cattle guard is a pipe “bridge” over an open culvert that is installed in place of a gate; vehicles can easily drive across it but cows will not walk over it because the open space between the pipes scares them.) On a private road this is doable, only takes money; on a public street it’s not feasible. Unless it’s 8 ft or longer across it won’t stop tracked vehicles but 4 ft will stop wheeled ones. When SHTF, pull the cattle guard. A properly constructed one that will handle today’s truck traffic will weigh at least 1200-2000 lbs so equipment will be needed. It’s probably a good idea to make the cattle guard in sections to make it easier to handle. A caution: any road impediment, whether it be a pile of gravel or dirt, a ditch, a culvert with a removable cattle guard, will require 24X7 overwatch. Gravel/dirt can be pushed out of the way, ditches and culverts filled in (dirt, gravel, branches, lumber scraps, pieces of vehicles, animal or human bodies, anything that’s available). Pro tip: whatever access controls you employ, take the time now to locate and establish an “emergency escape route” not dependent upon the main road normally used for access to your property. The emergency escape route MUST be extremely well camouflaged and not the slightest bit obvious that it can provide hidden access to your property. Anything man made will stand out and draw attention. One method is dense brush that appears impenetrable but can be driven through; remember others will figure out they can drive through it, too, so more solid physical barriers will be required. Vertical posts are man made, but “random dead-fall trees” that can very quickly be winched or pushed out the way – especially if they’ve been there long enough to have brush growing around and through them – won’t appear man made. 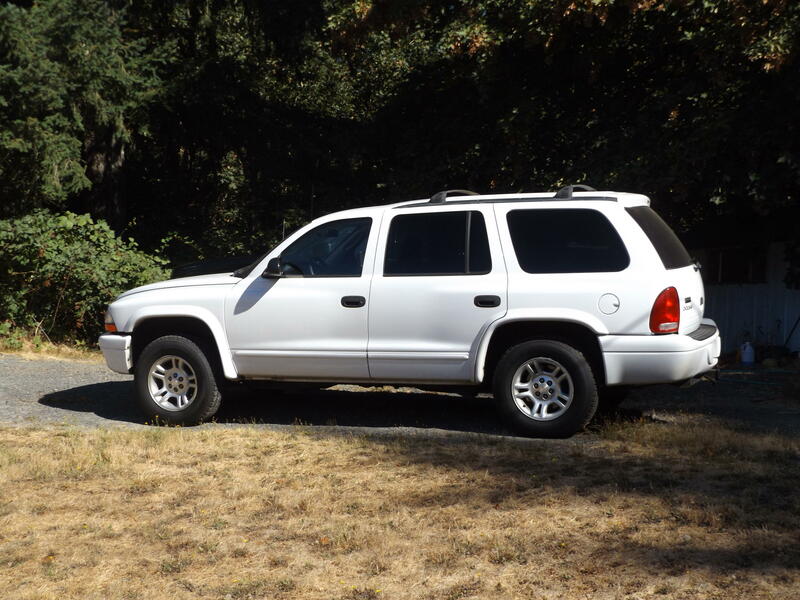 Consider maintaining a “sacrificial vehicle,” – NOT YOUR BUG OUT VEHICLE – that can be used to push/pull such barriers to allow your bugout vehicle to pass then abandoned and very rapidly permanently incapacitated in a blocking position to prevent vehicles following yours (think “missing wheels and smashed distributor” rather than “flat tires.”) If the emergency escape route is used even once, for even casual foot traffic, it will show that, so once established never use it and inspect it from a distance. That’s a very well thought out plan and if you had like minded neighbors who realized the advantages of keeping the hordes away from the various properties it is something quite doable with everyone pitching in. This would all be done on a private road as you had explained and in my previous post I failed to mention that I was talking about a private road also. Thanks for your information. You see. He does not plan to leave, but he is prepareed to leave!!! Always thought provoking topics and perspectives in the articles and commentaries. Preparedness is highly situational and based on risk (e.g., frequency, severity, controls, duration of event, remediation and time to onset of event). How you mitigate risk is the planned preparedness and resourcefulness, with some luck and a practiced plan. Like the plan and practice by Pat and what others have shared, and very familiar with the NW environmental risk – east and west of Cascades from fire, earthquake, floods, volcano – I’m a survivor of St. Helens, tsunami, Hanford, Golden Horde, or more likely the threat of “we are the government and here to help”. For me and family, home is now in one of those flyover states, so how do you plan for these different risks (tornados and winter storms complicate by power failures)? The simple one event risks can be managed, but preparing for risks that cascade out of control is the bigger challenge, and resourcefulness (via individual, community, or government) is as important as preparedness. I routinely read the NTSA reports as a SE pilot (my wife thinks I’m morbid in doing so), and what I’ve learned and soon realized is how many little events, situations, technical knowledge (perhaps mental sharpness), checklists, and critical (right time) decisions contribute to a life or death outcome as a pilot (you survive a crash up north but die from exposure before you die of thirst or hunger – if I’m flying and the terrain is forecast for temps below freezing, then in goes the cold weather survival gear). Have learned a lot over the last 10 years (most from what I read on this site) in my journey to be more prepared, and like the author, age is shaping my plans, capacity and resourcefulness. When everything is important, becoming overwhelmed (or financially constrained) will compromise any outcome or plan. My go to source is a friend that ran the survival school out of Fairchild AFB – amazing what you can learn about the discipline to survive. Beyond faith, family and fortitude, my focus has been to plan based on the risks is for a “bug in” about 85% of time for most situations (includes moving to the next outer ring of urban sprawl – at least 20 miles out – upon retirement) and leave the exodus option to less than a 15% likelihood, and this event will be highly dependent on if you could expect to return home. So, how to triage and prepare for the many risks? I’ve focused on a few to give me the foundation, then have built out each of the following areas based on one’s perceptions of the risk, and my focus is now how to do this important work as my wife and I age in place. An organized, socialized and documented plan, complimented by some practice – actual or discussed. Better to describe and discuss beforehand how to hook up your backup PV equipment with others if you are the only one that knows how it will need to go together. Mental and the physical capacity to save a life, including your own – must be able to administer ABC first aid, in a life threading condition. Then have the skills, knowledge (books), and supplies for care and recovery. Skills, knowledge and supplies to stay healthy – avoid getting sick from contaminated water and food, unsanitary conditions, and exposure or infections when there’s no medical support. Sufficient and reliable source of potable water, food (the right calories, protein, fats and vitamins), easy meal preparation, and the skills to hunt, forage or grow your own, including its storage. Shelter, and most importantly a source of reliable heat – if you have water, a hot climate is survivable, but read any winter war stories and you can soon realize that freezing to death or hypothermia is much more common threat. Sanitation in all forms and manner, especially when there’s no sewer or septic systems, and how you care for the deceased. Personal protection (the right tools, training and mindset to act) and the protection afforded by a common community, including the means to establish situational awareness. Keep it simple – a few calibers and redundancy of weapons that are accurate, reliable and easily repaired and maintained. Source(s) of energy – how to capture electrical energy and carbon based liquid fuel (short term), wood and coal (long term), and the storage of energy for future needs, including how to protect the modern electrical equipment from a CME/EMP events. Simple reliable transportation by bicycle or boat (or a simple, old distributor ignition system in a car or truck – and for me this is a vintage truck), and a cart or trailer to carry what you can’t for 25 miles. The skills and tools to communicate (for me it’s Ham and HT radios) with others and to supplement your situational awareness. Document and store who you are, what you own, and what you want others to know (last will and testament); and document your bug in or out plans if others need to known – where are things, how they work, and where to meet or where you’ll leave a message. Financial security – living within your means and constraints, get the right combination of assets, equity, sources of income (barter), savings, security and planning to survive in the short/long term. Bug out bags for each situation (do you have a bag at work, in your car and at home) – need one for a gotta go now, and the additional bags (boxes, totes or containers) for a gotta get out in the next day or next week. The little things that may make life comfortable when all of the conveniences of modern living are gone – a few good book, the Bible, games, toys, keepsakes, pictures, storytelling, and the paper and pencil to record your life for others to know – remember there may be no electricity for your iPad, phone, internet or TV (especially the liberal media and fake news to get you all work up) – all so sad but easy to do without! Redundancy of the tools, supplies and skills that are critical to the risks you are seeking to remediate. 3 years ago at the young age of 60 ( tongue in cheek here ) I decided to take my 38 lb BOB and see how long it would take my to walk 10 miles with it, or if I could even do it. Well I set of and my goal also was to not sit down or rest even once. I made it in 3 hrs 20 minutes. The route was up and down moderate grades but not cross country. The last 2 miles were pretty hard, actually alsmost tortuous. Now 3 years later I feel I could do it again, maybe, but man bugging out on foot would really be a total last resort in my book. My wife has a problematic back, which would limit what she could bug out with. Our daughters are adults and in very good shape. What I learned most is 38 lbs is upper limit for me, and probably to much actually. I’d rather, if roads become impassable due to traffic back up, take my Honda ATV. I can go a lot of places with that thing that even 4 wheel drive SUV cant go. My wife goes on the back, we can carry both BOB’s, a tent, and a few other assorted survival sundries and get back in the bush. But even that would be less desirable than vehicular bug out. Good points in pats article though. heh – 40 comments. I’ve often thought that the core of “prepping” is the rush of adrenaline experienced when contemplating “the bugout”. I guess I have a different idea than others. Should the USA go t**s up, I cast off my 45 foot Liveaboard and sail/motor away. With fuel aboard, plus the Wind, literally the entire Pacific is in range. I would prefer to stay, as I love the Pacific Northwest and I hope that the Northwest Front will be able to form a homeland, but the Storm clouds right now look very black as the Left is already talking about “Targeted Assassinations” of White Males. This isn’t even Anarchy, this is the most evil kind of warfare. We will need men of training and courage to teach the upcoming generation how to fight and survive. Even 67 year olds can teach children how to handle a knife, read trail sign, teach History and Truth. Will you abandon your people when you are needed most? Thanks for the time spent on sharing your plans. Something I have done is, with the aid of state paper maps, I count off zones in 10-20-30-etc miles. This provides a visual of folks leaving a population center. Its is difficult to gauge a time for hungry/thirsty/cold evacuees to start showing up on your doorstep in your undisclosed location, but it might. Keep in mind the range people can travel in clogged roads by car, on bikes, on foot. G-maps has some very good times for a variety of transportation modes to give you some estimates. Of course ill-prepped neighbors will come knocking in minutes. Another aspect is the lesson of what we are seeing in the latest Indonesian EQ/Tsunami. There might be no other option than Plan C as roads are impassible. “Readers kept it, even after it was removed.” Do you want people to stop using it? Also if your bug out plan involves vehicles have you realized yet that thigh rigs are awful in confined spaces like that? Have you also realized that outside the vehicle they make sprinting to cover equally terrible? Have you found that while the spare mags on the pistol holster look cool they are near impossible to retrieve during an actual reload? There’s so much wrong here that could be discovered through realistic (or any) training with the gear you plan to use.